Looking around the internet, trying to find some inspiration for a new (domestic) cat design, I was a bit disappointed. There are so many girly cat designs and so many big cat (tiger) designs, but I couldn’t find one single (domestic) cat design for boys. So, although I was planning on creating yet another girly cat design, I changed my mind and made a boy-friendly version.  Here it is! When painting design for the first time on a real face, I like the start with a rough sketch to find the proper placement. Of course, I make sketches on board too, but those are flat and it is not always possible to copy them completely onto a face. That’s why I make a sketch first. For this sketch, I used a watery, glycerin-based white paint and a small round brush, #3. Tip: Confused with what is “glycerin-based” white? There is also a wax-based white too!  One works best for linework, while the other one — for background and blending. Learn more about it here! I wanted my design to have a cartoony look to it. That meant that I needed ‘clean’ contours. The easiest way to get those is by using a flat or angled brush for the base colors. 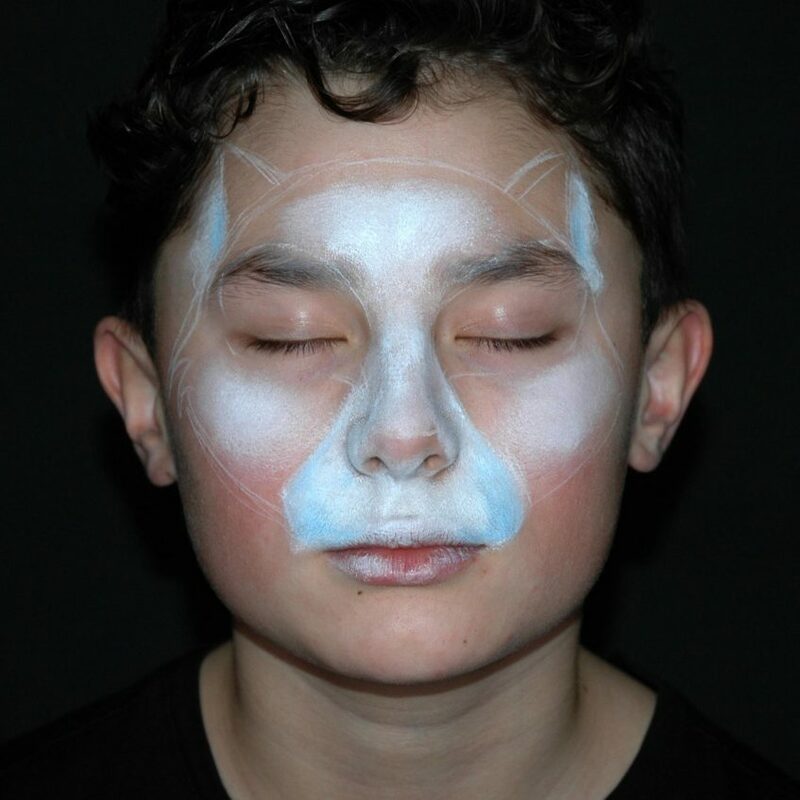 But to be able to get nice coverage and blend on the forehead, cheeks, and muzzle I first added a base with glycerin-based white and a sponge on certain areas. To give the design extra color and depth, I also added some light blue on the sides of the muzzle and ‘in’ the ears. 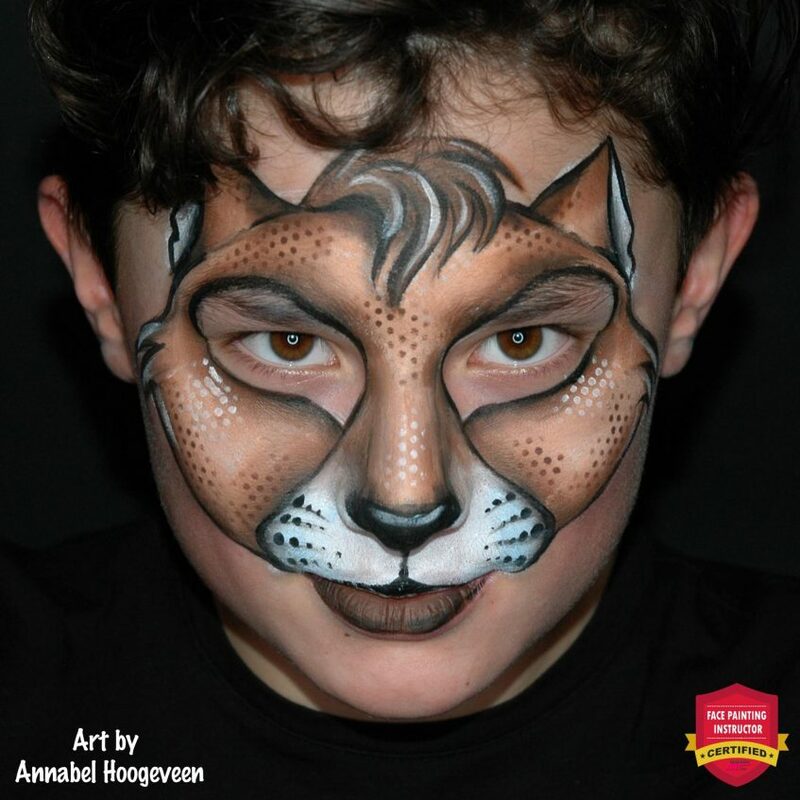 Tip: Did you know that Annabel Hoogeveen is our most experienced instructor? She has taken more than 60 (!!!) 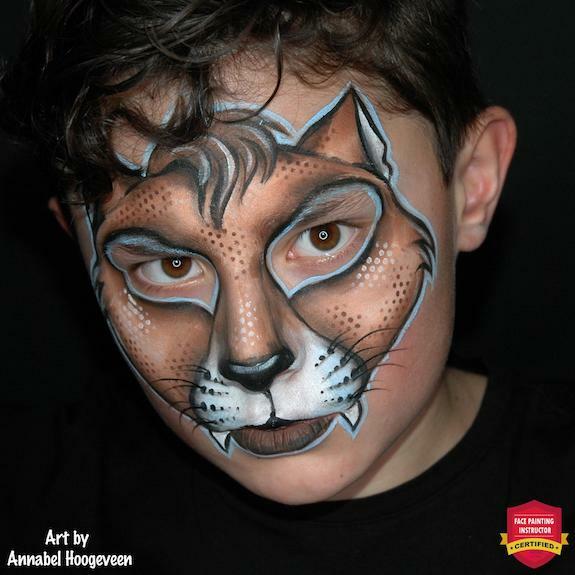 workshops by top-leaders of the industry and has been teaching the art of face painting in her studio in the Netherlands for many years before she joined our team! 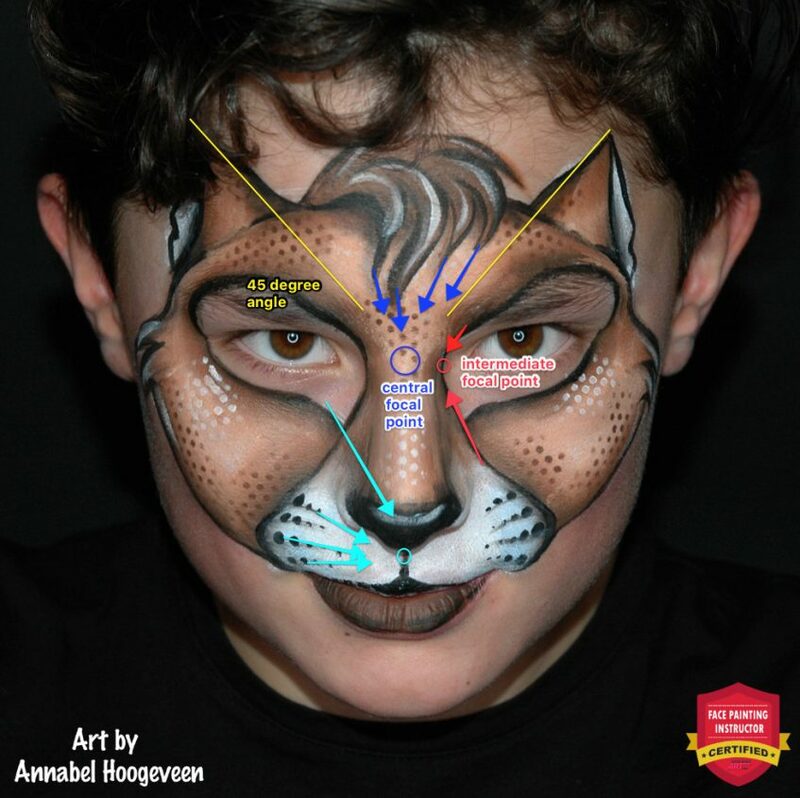 Today we are super proud to have her on board as an official International Face Painting School instructor! Check out more about Annabel in: “Annabel Hoogeveen: Unlocking the Secrets to Creative Success“. To finish the base I loaded a flat wide brush with a brown split cake and filled in the rest of the design. In this case that meant following all the contour lines with my flat brush and always keeping the darkest color on the side of the contour line. After that, I painted the nose area. The ‘empty spaces’ on the cheeks and forehead I filled in next with the lightest color on my brush. Because there was already a white base in the middle parts, the colors blend easily. The coverage isn’t perfectly even, but it doesn’t have to be because I will add some texture with stencils later on. Instead of painting fur, I added some texture using a regular sponge, white and dark brown paint and a stencil. After adding the texture I loaded a round brush #8 with two colors of brown from the split cake and added the hair on top of the forehead. The hair is not painted randomly. 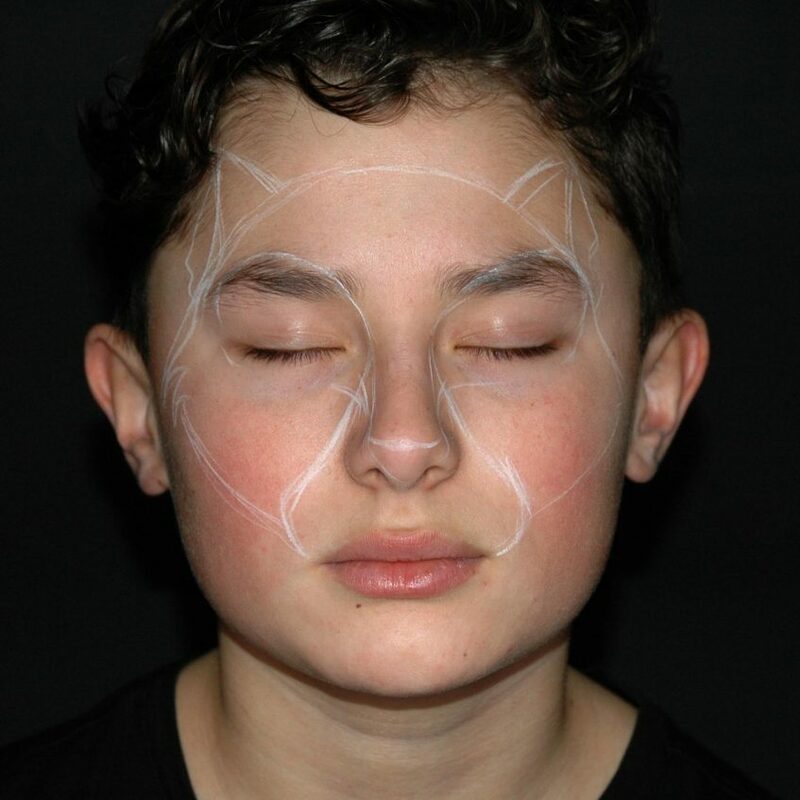 The difference in length of the individual strands and the placement are working together to create a main direction towards the central focal point. Tip: Check out how the training at the School is changing lives in “The Payoff: The Graduates of 2018 Discuss Their Success & The Investment They Made in Themselves“. Using the same split cake I loaded a round brush #3 with a mixture of black and brown and added a triangular nose (not the one I usually do in cats, but the shape you see in cartoon cats), a muzzle with dot lines and outline all around. This will tie the design together. Because I thought the white next to the nose was a bit too much, I blended the brown from the nose into the white a bit more and pulled it down with a dry chisel brush. The bottom lip I painted brown with the round brush #8 I used for the hair earlier (on events I would use a lipgloss applicator for sanitary reasons ), and outlined him with the black from the split cake and a round brush #3. 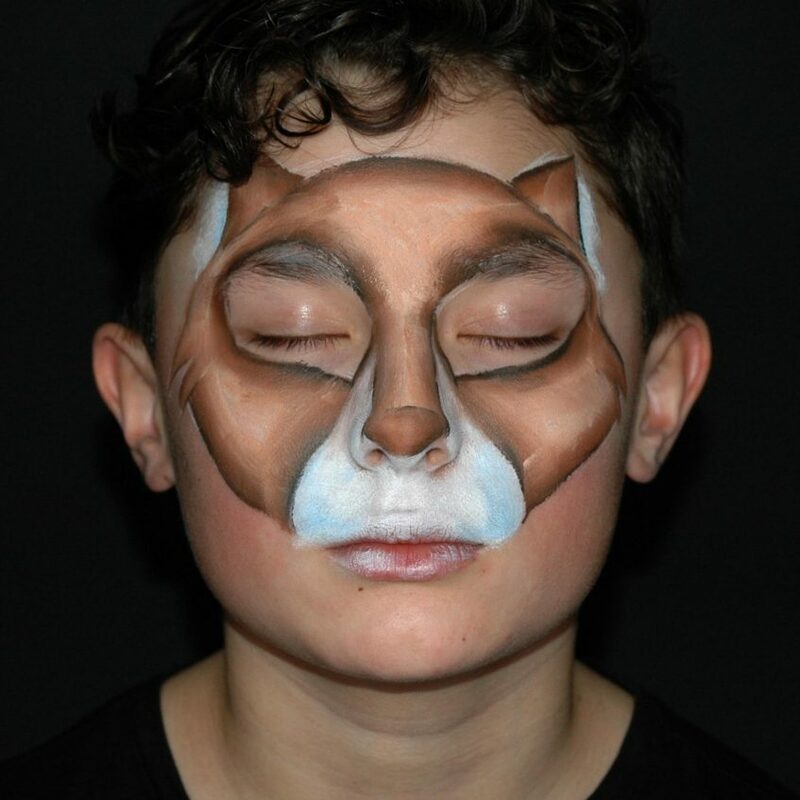 Using a small blending brush and a baby wipe I softened some of the dark contour lines, blended the black lip line into the brown to get a softer look and ‘pulled’ the black of the nose a bit up on the sides. Next, using the same technique, I added some shading on the ears, on the sides of the muzzle and under the muzzle dots, in the hair strands and underneath the hair. Almost finished! The final step in finishing this design is painting some highlights. Using a round brush #3 and regular glycerin white, I added just a few highlights on the hair and nose. Want to learn more about the School? Take a Class here! 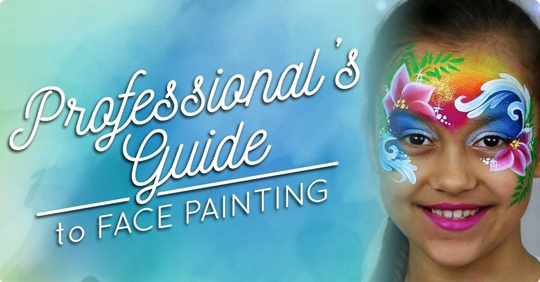 Get the training you need to face paint like a professional! If you have a bit more time, you can add little fangs and some whiskers too. For the fangs I used a round brush #3 and regular white. The outline I painted with the same brush and regular black (or black from the split cake). 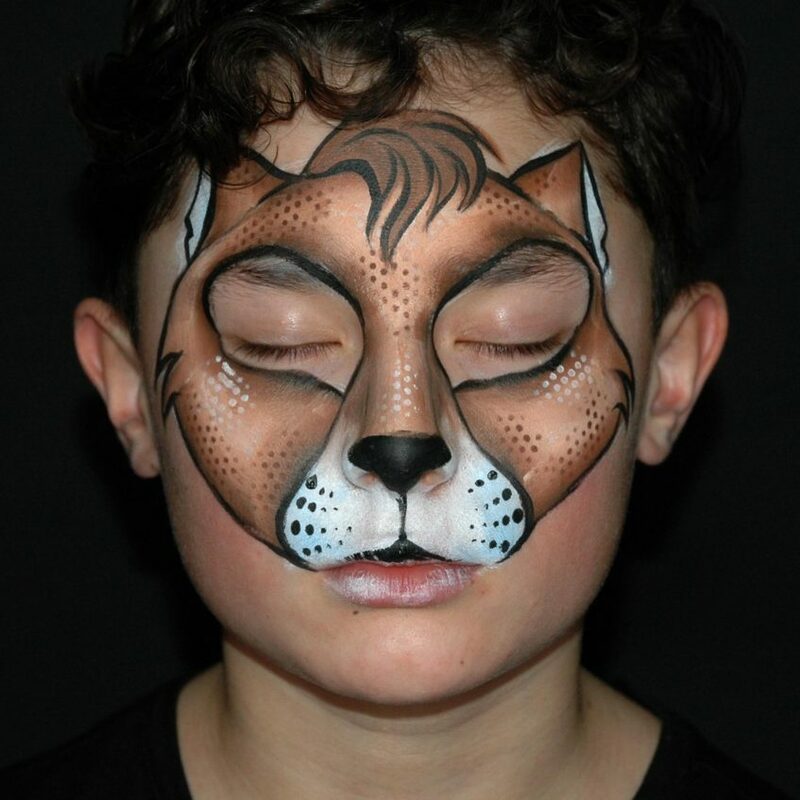 For the whiskers I used a liner brush with regular black. 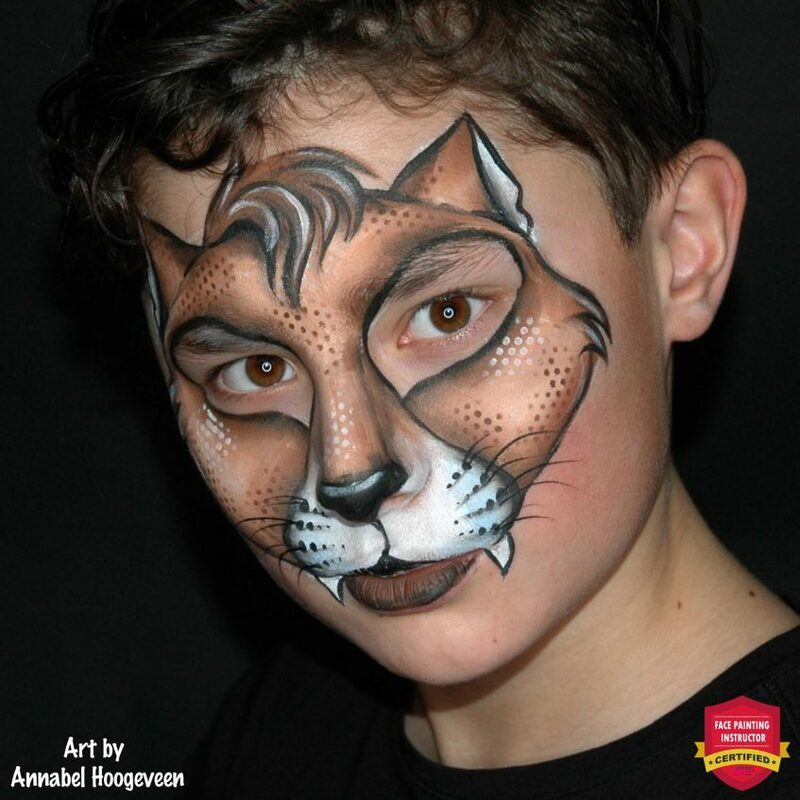 Liners are the perfect tool for painting whiskers, but don’t paint too many! Just a few, different sized ones (not too long) will do the trick. 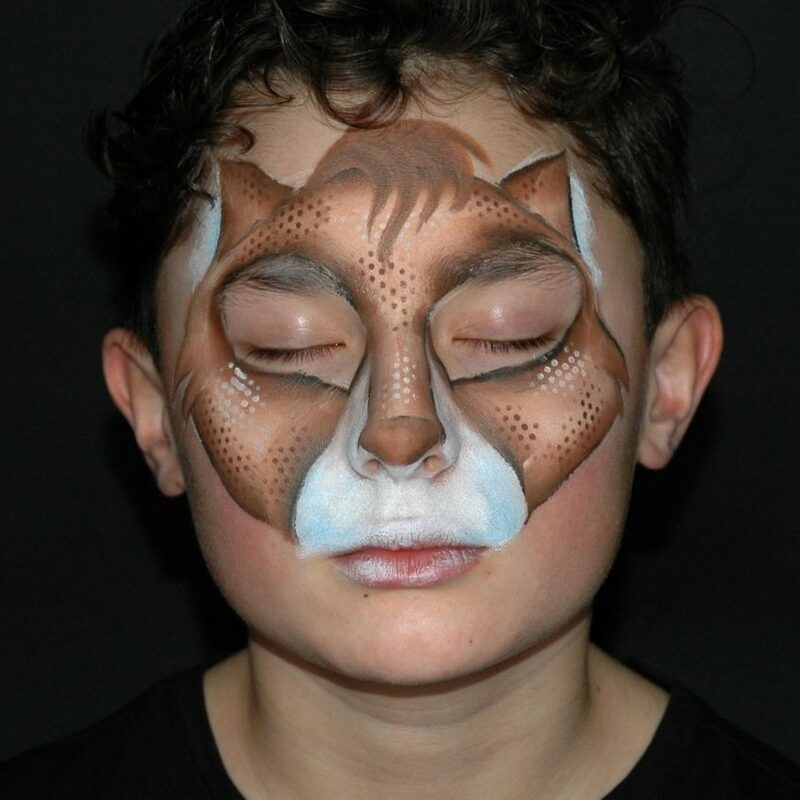 For this design, I used a brownish color because my favorite cats are Abyssinian cats. I just love their beautiful brownish color , but it doesn’t stand out very much on the skin. If you do want the design to stand out a bit more, you can either choose a different split cake color (you can use any color you like!) or outline the entire design in a contrasting color. So, that’s what I did. Are you impressed with Annabel’s linework skills? 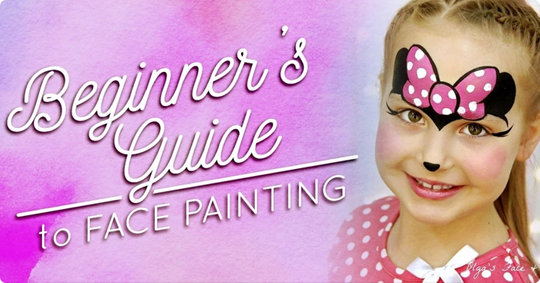 You can paint like her too! We’ll teach you how in this FREE “Improve Your Linework in 3 Days” Online Workshop!